Poorly run training is worse than a poke in the eye. I’m an Advisory Mentor for the Queen’s Young Leaders. I typically Skype, but yesterday a mentee from Nigeria sent three questions via email. His first question concerns engaging people effectively in leadership training classes. Design training with participants, when possible. Avoid having participants sitting in classroom style. Play music when people show up and during breaks. Energy goes up when people have to speak a little louder than normal. Provide opportunities for non-threatening participation. Ask them to describe a leader who had a positive impact on them, for example. Divide people into groups of five or six for group conversations. Walk around when you teach. Teach in a conversational tone. Discuss real life situations. Relevance is interesting – theory gets boring. 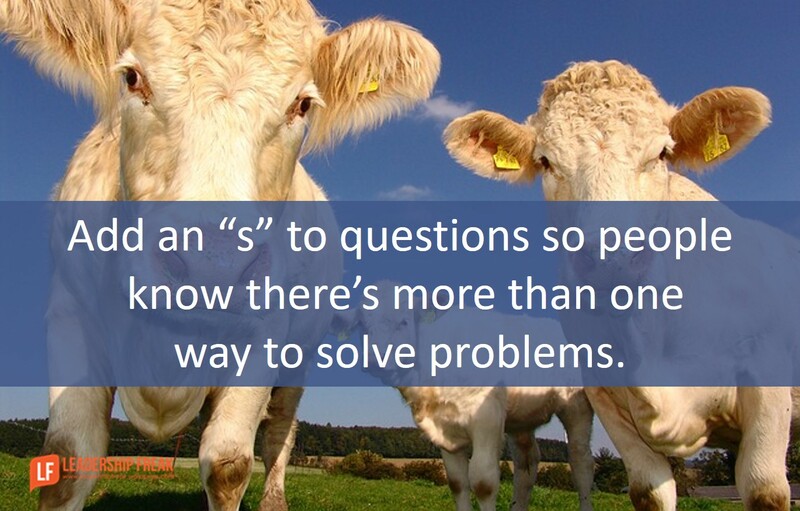 When asking questions, add an “s” to questions so people know there’s more than one way to solve problems. Share a few success stories, but don’t come off like a know-it-all. What’s shifting in your thinking? What’s a useful take-away that you could put into practice today? What’s coming to mind for you? Send discussion questions to the group a day or two before the meeting. Bonus: Make a list of the things you hate about training classes. Don’t do them. What suggestions do you have for effectively engaging people in leadership training classes? How can leaders draw out efficiency from individual team members in a group task? Superb list, Dan. Lots of useful things. Thank you. Thanks Marc. Here’s to great training. I think the general attitude of the instructor matters a great deal. If you have a positive attitude then it will less of a slog through the material for the participants. This includes not reading the slides, talking to the participants before the class starts to get to know them and have and having a lighter more playful attitude overall. …Focused clearly defined expectations. Also grouping members to insure strength/tendency variety. Do not put all the detail people or all the visionaries together. Mix and match to get a good blend. That does take some prep work but is likely worth it. Thanks a great deal for sharing this with us. I find this very helpful. Regarding protecting the group from the participant who monopolizes the conversation: I find myself at times needing to cut the monopolizer off…..how might that be accomplished while protecting the offenders dignity? This is a great post (they usually are!). I just shared it with son at college who runs the Activity Board there. Although you call it “training”, I think there is a lot that can apply to presenting in general, especially when you are presenting to a group where the intent is to share ideas about what has worked for your team/organization and learn from each other. Nicely said, and I always enjoy concrete suggestions. I thought your comment about adding an “s” to questions was very interesting and tracks well with some of the wisdom in “Decisive” by Chip and Dan Heath. It opens up your mind when you realize that the most productive decision is only likely to be found when you consider the spectrum of decisions possible! As someone who teaches regularly, I found this very insightful and reaffirming the practices I already use, plus I like the idea of music at breaks. I additionally use role play to draw out those wall flowers that can be overwhelmed by the Alpha’s if you let them. I like to ask participants to imagine themselves leaving the class feeling like their time was well spent. Then ask what was it they learned that made them feel that way. That really works well to help us build engagement when we walk through the overview of the class. Excellent Tips! Thank you Dan. This may seem a bit ordinary, name tent cards with a scenic picture. At an ‘educators course’ the diversity in the class was by design; for 2.5 days the class would spend time together, learning, sharing meals, and life for a bit. At opening session in lieu of name badges were blank tent cards, w/ several color pencils/markers, the Course Director would ask participants to write their name on one side and a scene on the other side (I think he said a scenic place other than here – it got chuckles); the CD would learn names and had an opportunity to ask about the ‘scene’ getting to know each person; it worked. These were seasoned surgeons, and they were pretty good artists, too. Great tips! I think the use of humour really keeps the audience engaged. If you are not a witty person by nature, perhaps include a funny picture/video to help out. I would appreciate some hints on how to deal with ‘know-it-all’s’ in the audience. Join over 452,170 Leadership Freak followers, fans, and subscribers. Leadership Freak by Dan Rockwell is licensed under a Creative Commons Attribution 3.0 Unported License. Based on a work at leadershipfreak.wordpress.com.